If you're finding that the blurred vision, slurred speech and inability to stand up straight are affecting your ability to detect if you're drunk, well fear not, the NHS has a solution for you. 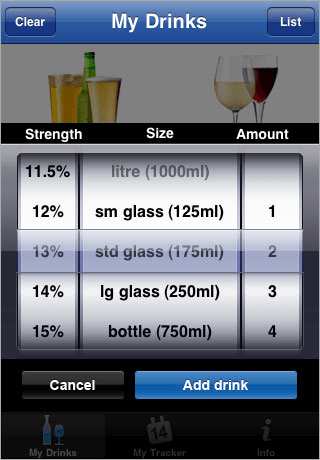 They've released a free iPhone/iPod Touch application - NHS Drinks Tracker - that will happily help you keep track of your alcohol consumption. I downloaded this to my iPod Touch to see what it was all about and whilst potentially quite useful I can't help feel it's a bit useless other than for comparisons around the watercooler in the office the next morning. What's more, by the the time you're drunk enough to think it's time to tot-up for the night (pun intended), your lack of dexterity will get the better of you and you'll be entering all sorts of rubbish when attempting to select the drink, ABV (assuming you know this), it's size and how many you've had. I also found a limitation in the app: if you're a fan of Tokyo* Beer and it's 18.2% ABV content (and hefty £10 for a 330ml price tag), you can't keep an accurate record of your units as the app will only allow you to select a maximum of 9% for beer. Oh well, you'll be so sloshed after just one bottle that it won't matter if you can't keep a record. Oh, and for those of you who drink heavily at your desk, you can download a Windows PC or Mac version of the application too.